The Atlantic herring forms some of the most spectacular schools of any fish species. These enormous aggregations can consist of billions of fish, and extend for literally miles in all directions. Atlantic herring occur throughout the north Atlantic ocean, from the Bay of Biscay northward to Iceland and southern Greenland. Their range extends eastward into the Arctic ocean and into the Baltic Sea. To the west they are found along the east coast of North America, from south west Greenland and Labrador down to South Carolina. The species occurs all around the Irish coast. Herring are silvery fish with a single dorsal fin, no visible lateral line (a sensory line that runs horizontally down the the mid-line of most species of bony fish) and a protruding lower jaw. Unlike many marine fish, herring have soft fins that lack stiff supporting spines. 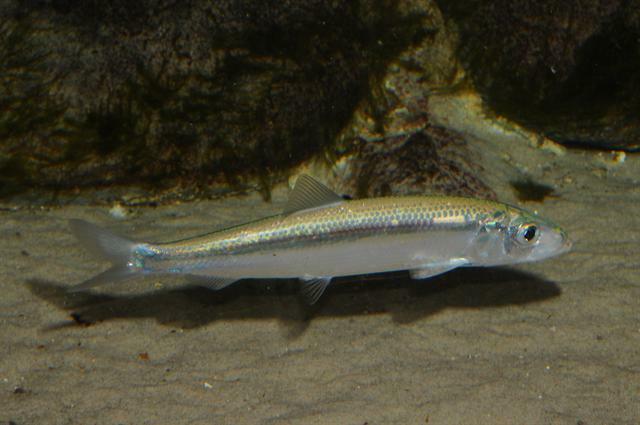 Atlantic herring grow to a maximum of about 45cm (18 inches) and weigh up to 0.68kg (c. 1.5 lb). The herring has a classically streamlined body shape designed for swimming through open water. It is deep and slender, tapering from its deepest point just in front of the dorsal fin forwards towards the snout and backwards towards the tail, which is deeply forked. As well as serving to improve the fish’s hydrodynamics, the laterally compressed body makes individuals less visible when viewed from either above or below. Another feature that helps camouflage herring is their colouring. At first glance they appear uniformly silver, but closer inspection reveals a darker, blue-green iridescence to the scales of the upper surface and paler colouring on the underside. This “countershading” means that fish blend in against the lighter sky when viewed from below and fade into the darker depths when viewed from above. Herring feed on tiny animals, collectively known as zooplankton, that live in the surface layers of the ocean. Tiny crustaceans called copepods form a key part of their diet, as do the plankton-dwelling larvae of other fish, crustaceans and molluscs. In late summer and early autumn adult herring gather in enormous schools and migrate from their offshore feeding grounds into shallower coastal waters to spawn. Fertilisation is external, with females laying their eggs as males simultaneously release clouds of “milt”. Females typically lay between 20,000 to 50,000 eggs, but very large females can lay up to 200,000. After spawning the herring shoals migrate back offshore again. The fertilised eggs sink to the ocean floor where they form vast carpets at depths of between 4 and 180 metres (13 to 590 foot). Those that avoid being eaten will hatch in between 10 to 40 days, depending on the prevailing water conditions. At hatching Atlantic herring larvae measure about 6mm (c. 0.25 inch) long and look nothing like an adult fish. As they grow they gradually develop their familiar fish-like features. By the time they reach 40mm (c. 1.6 inches) they start to resemble smaller versions of the adults. Very large shoals of these tiny fish often gather in coastal waters during spring and early summer. Many other species rely on herring as a source of food. A host of fish species prey on them, as do seabirds like gannets, puffins and terns. They are also taken in huge quantities by marine mammals like seals, porpoises, dolphins, killer whales and the larger baleen whales. Finally, of course, they are eaten by man, and herring fisheries have existed throughout the fish’s geographical range for hundreds of years. Despite their vast numbers herring stocks are still vulnerable to the pressures of overfishing, as demonstrated by population crashes in the 60’s and 70’s. Numbers have recovered since, but care is needed to ensure that these fisheries remain within sustainable biological limits. It goes to show what good fishery management can do. The south coast (Celtic Sea) herring fishery is one of the most managed fisheries in this country, with a fishery management committee made up from all interested parties representing science, marine institute, fisheries department and fishermen. Strict quotas are imposed and controlled, and there are shut down areas in place at different times. The fleets only get certain areas open to them at different times. This system has been in place for nearly a decade and I do believe that we in the whale watching and wildlife community are seeing the benefits, with what looks like a plentiful supply of Spratt and herring inshore every year to attract the wildlife to our coastline. This is surely a good news story, and proof that multiple groups coming from completely different sides can put together a sustainable plan that works to benefit all concerned, and as an indirect result benefits and improves conditions for the wildlife of the areas. Let’s all work together for the good of our planet.